As we head into Week 6, it’s time again to look at our top IDP streaming options for fantasy football. It was another good week for our streamers in Week 5 as several made big plays. Vikings lineman Stephen Weatherly forced a fumble of Carson Wentz after a sack, while Lions lineman Da’Shawn Hand also had a sack and added a fumble recovery. Ravens linebacker Terrell Suggs also had a sack while Falcons safety Damontae Kazee notched a pass defensed to go with his six tackles. Our only fail was Eagles safety Corey Graham, who suffered a hamstring injury. We’re now a few weeks into bye week season to go along with the usual spate of injuries, which means more streamers are needed now more than any other point in the season. Jason Pierre-Paul may get more attention along Tampa’s defensive line but Curry has been just as effective. He has 12 quarterback pressures to JPP’s 13 despite rushing the quarterback 17 fewer times (in fairness, JPP has four sacks to Curry’s two). This week, Curry and the Bucs play the Falcons and their deteriorating pass-blocking. They’re in the middle of the pack when it comes to pass attempts — ranking 14th at 38 per-game — but are eighth-worst at sacks allowed per game with 3.2, including a whopping six last week to the Steelers. Their line also ranks just 23rd according to PFF run-blocking grades, while running back Tevin Coleman, who has seen most of the snaps at running back this year due to an injury to Devonta Freeman, ranks just 24th out of 41 qualified running backs in pass-blocking. Curry will he hardly owned, if at all, and should be readily available in a matchup against a team that is trending in the wrong direction when it comes to blocking their quarterback. 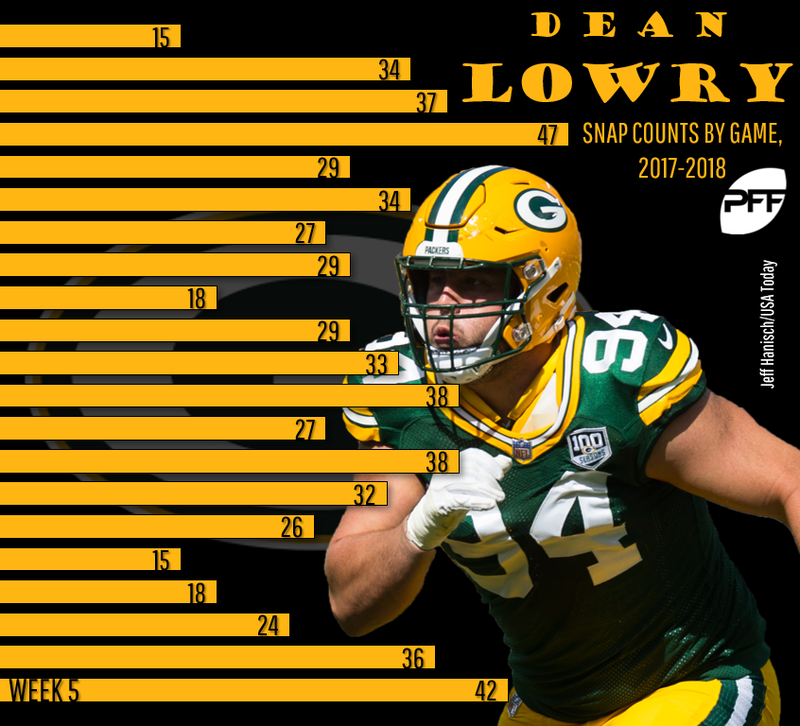 After new Packers lineman Muhammed Wilkerson suffered an ankle injury that put him on injured reserve, Lowry was the next man up, seeing an immediate uptick in snaps. He’s classified as an end on some host sites but really plays more as an interior lineman in the Packers defense and as readers of this series know, I love a good interior lineman. Over the last two weeks, as Lowry’s snaps spiked, he’s top-10 in pass-rush productivity, including creating seven quarterback pressures in 42 pass-rushes. That trend should continue as he draws the 49ers this week, who are currently tied for third-worst in the league with 3.6 sacks allowed per game including four last week against the Cardinals. San Francisco will also be sacrificing C.J. Beathard who, on average, has been sacked three times per start over his brief career. As with Curry, Lowry is relatively unknown and should be available in most leagues. If he’s classified as an interior lineman, even better. Either way, he has a fantastic matchup this week. Attaochu is one of those players who always seems headed for big things but never gets there. Injuries played a part — he missed 26 games in his four years as a Charger — but he just never came close to being a consistently dominant pass-rusher. After the Chargers moved on, he had a cup of coffee in San Francisco, and finally landed in New York as a depth signing. He played sparingly over the first month but was called in to action last week after Jets linebacker Josh Martin was put in IR. After seeing a season-high 33 snaps, he didn’t disappoint, strip-sacking Denver quarterback Case Keenum and creating three quarterback pressures on just 22 pass-rushes. With Martin still out, Attaochu should see plenty of action again. Even better, the Jets play the Colts in Week 6, which is great news as Indianapolis currently leads the league with 49 pass attempts per game, giving plenty of chances for a sack. Attaochu is strictly a rotational pass-rusher but against a team that passes that often, his snap count will look like a starter’s. The Ravens defense is a machine when it comes to producing unique IDP players. Last week we looked at linebacker Terrell Suggs who, while not racking up a bunch of tackles, still makes enough plays to be a fantasy stud. Smith is no different in that he plays mainly on the line of scrimmage but is qualified as a linebacker, a situation that doesn’t usually lend itself to a lot of fantasy stats. But Smith has been so disruptive that he’s remained fantasy relevant which should continue this week against the Titans. For example, his pass-rush-productivity rating of 8.8% currently ranks eighth among edge rushers while his total of 22 quarterback pressures ranks seventh. It’s only resulted in 2.5 sacks but the seven quarterback hits he’s had indicate he’s due to tack on to that sack total. The Ravens opponent (Tennessee) doesn’t run the most plays, ranking just 26th in the league while averaging 61 plays per game. But Smith stays on the field a lot, averaging more snaps than any other Baltimore lineman or linebacker not named Suggs or C.J. Mosley. The combination of snaps and how efficient Smith has been should lead to big plays this Sunday. With Maye injured the first three weeks of the season, it’s possible he’s been overlooked in IDP leagues. If so, Week 6 would be a great week to stream him. He recorded seven tackles in his debut in Week 4 then exploded in Week 5 for eight tackles, a half sack, an interception and a forced fumble. He now gets the Colts who, as mentioned above, are leading the league in pass attempts per game with 49 and are third in offensive plays per game with 71. They’ve allowed a player from the secondary lead their respective teams in tackles the last two weeks including last week when Patriots defensive back Devin McCourty had an incredible 14 tackles against Indianapolis. Lewis is a streaming option this week when the Titans play the Ravens due to a combination of injury and opponent. He’s filling in for starter Kenny Vaccaro, playing 100% of the defensive snaps in Week 5 and ticketed to start again this week. It’s good timing as the Ravens are second in the league with 46 pass attempts per game and actually lead the league in offensive plays per game at 76. It’s a big improvement from last week’s opponent, Buffalo, who ran only 64 against Tennessee and led to only three tackles for Lewis.